Early this year I got a prototype off the ground that did a passable job at the basic features that I wanted (argument hints, jump-to-definition, and of course decent auto-completion). Using that prototype, I duped the crowd into kindly spotting me some money to continue working on it. The result is called Tern (github), which is now an editor-independent static analysis engine that is being integrated into several different editors. In this post, I'll try to document how Tern works. As a first step, Tern parses your code using Acorn. If it's not currently syntactically valid because you are in the middle of editing it, it still parses it, using the error-tolerant parser in Acorn. But we also want to complete property names, show argument hints, and jump to the definition of functions and types that are, for example, stored in a property. The type inference in Tern is done by a second pass (after the one that builds up the scopes) over the code. You can picture this pass as building up a graph that represents the way types flow through the program. Each variable and object property, as well as some kinds of expressions, will have an abstract value associated with them. This is a set of types that have been observed for this element. These are the nodes in the graph. The edges consist of forwarding information. For example, if the expression y = x is found in the problem, the abstract value for variable x will be set to propagate all types it receives to the abstract value of y. 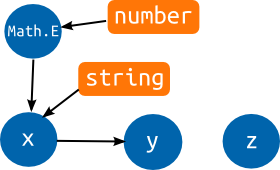 Thus, if x is somehow known to be a string, y will also get type string (but might, depending on how it is used, receive more types than just that). Let's see what the graph would look like for this pointless program. You see blue circles that represent the abstract values for our three variables and for the Math.E property. The orange boxes are actual types. The basic ECMAScript definition file has given Math.E the type number. Since it is then assigned to x, an edge is added from Math.E to x, which causes x to also get the number type. y is initialized to x so it gets all of x's types. When x is assigned a string value, the string type flows into it and, consequently, also into y. The variables now have both the string and number type associated with them. Variable z is never written to or read, so it just sits there sadly in its corner, without any connection to the rest of the program, and its abstract value remains empty. Note that in actually executing this program, x would end up with a string and y would still be simply a number. Tern ignores control flow and pretends everything in the program happens, basically, at the same point in time. This is an approximation that's not correct, but that makes the graphs a lot easier and cheaper to construct. For typical programs, it doesn't have much of an adverse effect on the quality of the inference. Propagation of types is not always direct. In many cases, the algorithm will assign a specific propagation strategy, which may contain arbitrary code, to handle types that appear in a source abstract value. The most common case of this is function calls. For every function call in the program, a propagation strategy object is created that knows the arguments that were passed to the function, and has an abstract value that represents the result type of the call. The type of the callee is set to propagate to this object. When it receives a function type, it will set the argument types of the call to propagate to the argument variables of the function type, and set the return type of the function type to propagate to the call's result type. You can see the function types, as orange boxes, containing (references to) abstract values. Function declarations will cause such types to be created, and added to the variable that names the function. The purple boxes are propagation strategies. There are two calls in the program, corresponding to the two purple call boxes. At the top is a simple box that handles the + operator. If a string is propagated to it, it'll output a string type, and if two number types are received, it'll output a number type. The arrows going into the arguments and coming out of the result type of the call propagators are added as soon as the call is seen. The arrows coming out of the arguments and going into the results are added when an actual function type is found for the callee. 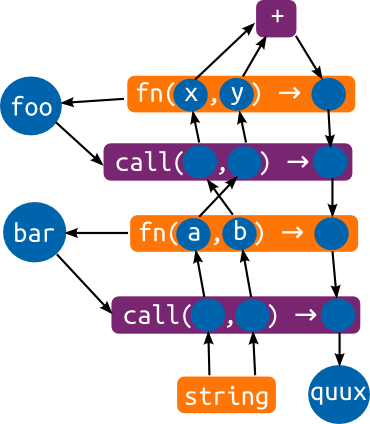 You can follow the string types that are passed to bar through this graph, being joined together by the + operator into a single string, and then flowing back down through the return types and into the quux variable. Tern defines a number of other propagation strategies, handling things like property reads and writes, and creating instances from constructors. These work in ways analogous to the call strategy described above. An important feature of these type graphs is that no matter in which order they are built, the final result will be the same. If you call a function that is only defined later in the program (or in a file that is defined later on), your call node will sit there patiently waiting until a type is propagated to it. And when that finally happens, it'll set up the necessary edges in exactly the same way that it would have done if the function had been seen before the call. One important property of this inference algorithm is that it will only give types to things when the types are actually observed being assigned or passed to it. This is fine, most of the time, but can be a problem for functions that are never called—no types will flow into the function's arguments. Why would you write a function and never call it? Usually because you are writing a library. Tern doesn't fundamentally solve this problem, but it uses a trick to be able to show at least something, even for abstract values that don't have any definite value. By looking at the propagations made from an abstract value, it is often possible to get some clue on the way it is used. If, for example, it is propagated to a variable that usually holds numbers, it might just be a number. If its charCodeAt property was accessed and the only type we know of with a charCodeAt property is the built-in string type, it's probably supposed to be a string. ... Tern will consider the frobs argument to be an array when displaying argument hints, but won't actually propagate anything to the return type, because it isn't sure (and once a type is propagated into the graph, there's no way to un-propagate it). This creates a new object that extends another object with some new properties. The type of the resulting object is not 'visible' in the source code. It is dynamically created at run-time. Yet, if a piece of code uses this pattern to set up its types, Tern will completely fail to understand it unless it can properly interpret what the code is doing. And now we're off into dodgy hack land. In order to meet this challenge, Tern uses a special treatment for for/in loops that appear to be copying properties. When it encounters them, it assumes that the properties from the source object will be copied to the target object. It ignores control flow (conditionals and such) and simply copies all properties. That solves half the problem. Now if you call extend once, it will create a new object type at the new expression, copy in the properties from props, and return it, resulting in more or less the type you'd expect. But, if you create multiple types using extend, you'll run into another problem. All of them will have the return type of extend flow into them, and the return type of extend will be all of them (a function has a single abstract value representing its return type). Thus, you'll end up with a useless mess that will have little to do with your intended object types. To fix that, Tern uses a heuristic to determine whether a function is a type manipulating function, and if it decides that it is, its return type will be computed in a different way. Instead of building a type graph for the function's content once, and connecting that to all argument and return types, the function is 'reinterpreted' for every call site, creating propagations only for the current arguments and return type. The heuristic to determine whether a function manipulates types or not is rather superficial, and will only catch the pattern in the example above and a few similar things. Every time a function assigns to a prototype property, instantiates a locally defined constructor, or copies properties in a for/in loop, a score is incremented. When this score, divided by the size of the function, crosses some arbitrary threshold, the function is marked as a type manipulator. If you first pass it an array of numbers, and then an array of booleans, the number and boolean types will both be flowing into the result of any call site of the function. To gracefully deal with functions like this, Tern tries to determine, after it analyzed a function, whether it is a generic function that has a return type that directly depends on its input type. To do this, it again makes use of the type graph, by performing a graph search trying to find a path from one of the arguments to the return type. It doesn't search very deep, since that'd quickly get expensive, but for example the randomElement function above has a simple path from arr, through a propagation object that propagates the element type of the array, to the return type. For calls to randomElement, instead of propagating from the function's return type abstract value, we simply take the element type of the type (or types) of the first argument, and use that. This'll correctly type randomElement([true]) as a boolean, and randomElement() as a number. The inference engine makes up most of complexity of the project. But above it is another layer, the layer that most client code talks to, which is not entirely trivial. In order to support an editor, we must also be able to maintain an up-to-date view on a code base as it is being edited. "text": "var foo = document.f"
Your editor could then use this information to provide actual auto-completion. The query/files format for request is intended to make it easy for editor plugins to update the server's view of the code as they are making requests. The server will save the files, so that if multiple requests are made without the document changing, there's no need to re-upload the code again and again. There is also support for sending only a fragment of a file, providing some context for the request but requiring this fragment to be analyzed in the context of a previously built up type graph and scope tree for the whole file. This is useful when dealing with big files—analyzing 6000 lines of code can take up to 300 milliseconds, which is too much for an interactive interface. If the 6000 lines were analyzed in advance, in the background, and when auto-completion is triggered, only the 100 or so lines around the cursor are sent to be re-parsed and re-analyzed, the server can usually respond in under 30 milliseconds. Another responsibility of the server is managing plugins that influence the way files are loaded. There are currently plugins for RequireJS and node.ns, which will automatically try to load dependencies, so that modules loaded through define or require will have their types understood by Tern. In closing, I want to give a quick overview of related work. This list is incomplete. There are tools (such as VJET for Eclipse) on which I couldn't find any detailed technical information, and there are likely others that I am not even aware of. You are encouraged to write me if you have corrections or additions. If you're curious about this technique, there's a very watchable video of a presentation by Jonathan Carter on this subject. Both projects have been more or less abandoned, and don't yield very good results. They did influence (mostly through Patrick Walton's doctorjsmm experiment) the design of Tern a lot. But I've always felt that the static, non-interactive way Ctags (or Etags) work, which undoubtedly made sense back when they were invented, is awkward and not really appropriate anymore. Tern uses a 'live' data source—a process that updates it analysis as you change the code—instead.